Flu season will be here soon, and the University is offering the campus community several opportunities, beginning this week, to get vaccinated—for free—against the most common types of flu expected this year. 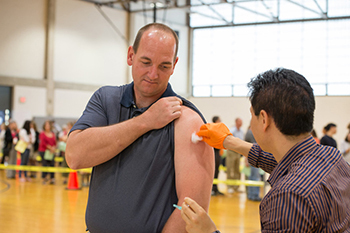 An employee receives a flu shot at one of last year’s clinics. The first flu clinic, open to all Syracuse University and SUNY ESF students, as well as Syracuse University employees, will be held Wednesday, Oct. 14, from 11 a.m. to 3 p.m. in Flanagan Gymnasium. It is a collaborative effort between the University’s Health Services and the Onondaga County Health Department, and organizers are hoping to give as many as 2,000 flu shots that day. To get your shot, you’ll have to show a valid SU I.D. You do not need to make an appointment. If you have questions, call Health Services at 315-443-9005. The Office of Human Resources will partner with Health Services to provide free flu shots to SU faculty and staff at two clinics, one next week and one the week after. You will need to show a valid employee SU I.D. to get a shot. Temporary employees may show an alternative picture I.D. No appointments are necessary. For more information about the SU employee flu clinics on Oct. 21 and 27, call the Human Resources Service Center at 315-443-4042.